If you've bought a few add-ons with one user account-- say, from an old, abandoned project-- and now you want to use them on a new project, you'll need to add that user to your project's Management Team and re-assign the licenses. It's not a difficult process, but it can be a little confusing to describe. Keep in mind that we'll be doing most, if not all of these steps at the concrete5.org website (not your site dashboard). There are a couple of things we need to check before we begin. First, make sure you have access to both accounts: the old one with the licenses, and the new one with the project you're working on. If you don't remember a concrete5.org password, You can always reset it if you have access to the email account you signed up with. Second, make sure you've released the add-on(s) from the old project. Go to concrete5.org and log in as the user that owns the new project. View your list of current projects. Click the name of the new project to visit its Project Page. Under Management Team, you'll see a list of users associated with the project. We'll be adding the old user here. 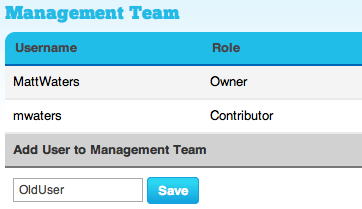 In the text field under Add User to Management Team, type (or better yet, paste) the old user name and click Save. The old user account will be now appear on the list, and will be able to assign add-ons to this project. Now we need to assign the licenses to the new project. This can only be done from the old user account profile. Log out of concrete5.org, then back log in as the old user. View your list of projects. Note that the new project is now on the list. Click the title to visit the Project Page. Select the license you want to transfer from the drop-down menu under "Add Item to this Project" and click Associate. The license is now assigned to the new project. When you log into your concrete5 site's dashboard, the add-on will now be available for download on the Add Functionality page.